W.A. 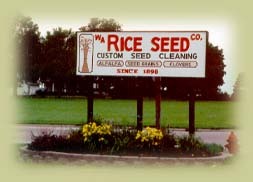 Rice Seed Co. manufactures a seed cleaning machine that separates seed based on texture of the seed coat. Usually good seed is smooth coated and weed seed is rough coated. Each pair of rollers in our Dodder Mill seed cleaner is covered with a special cloth which has a nap. As the rollers revolve, the rough coated seed is picked up by the nap of the cloth and separated from the good seed based on texture. Our Dodder Mill is used primarily to clean alfalfa and clover seeds. The principal idea is to operate the rollers revolving as slowly as possible and still clean the seed. Doing this will give you minimum throw over to be re-run if necessary.